The final on-track action of 2018 sees the LCR Honda IDEMITSU Team testing their RC213V prototype at the Angel Nieto-Jerez Circuit in southern Spain this week. 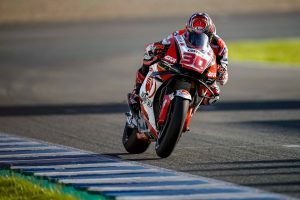 The team’s Japanese star Takaaki Nakagami ended day one of the test in third position overall and as the fastest Honda rider in the field. 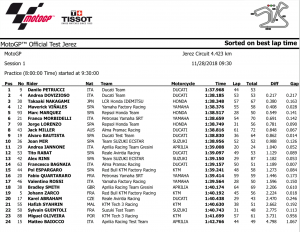 Today’s result followed a positive test last week at the Valencia circuit, and with 2019’s pre-season tests reduced to just two three-day sessions, this final outing is crucial for the team heading into the imposed winter break. 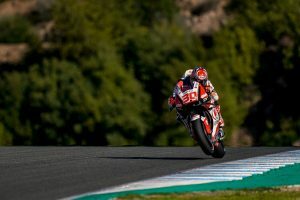 Nakagami focused on improving his feeling with his new machine, especially as regards rear-end grip, and completed 67 laps of the 4.423km circuit, with his best time coming on his 57th lap. “I’m really happy with today’s first day of testing, and in particular with my feeling on board the bike. The lap time was really consistent both with new and old tyres. We focused on trying to improve rear grip, and Öhlins gave me a different shock and some other new items to test which were quite positive for me, because I had a really good feeling with the machine”.